The current economic crisis plus the current financial problem of the city of Los Angeles have lead to a huge increase in the number of homeless people living on the streets of LA. So last weekend (Friday, April 2) Etnies (Sole Tech founder Pierre Andre Senizergues) paired up with Los Angeles Mission to provide more than 2,000 homeless men, women and kids with a hot meal and a brand new pair of Etnies shoes during the LA Mission's 2010 Easter event. The event also marked etnies' 12th year as a proud supporter of the Los Angeles Mission. Over the last 12 years Etnies has given 30,000 pairs of shoes to homeless people living in Los Angeles! According to the Los Angeles Mission, there have been a 10% increase in people coming in for meals and services in Skid Row, so it seems like a good time to give some more. Skid Row holds the majority of the homeless in Los Angeles County with more than 7,000 walking the streets in 2007. 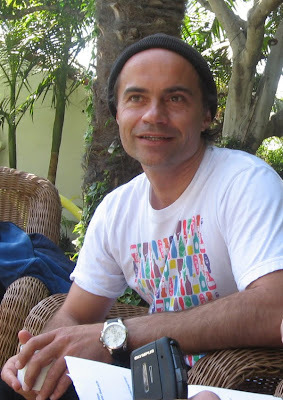 - Etnies owner and skateboarder for life, Pierre André Senizergues. Last year we met with Pierre Andre in his house in Malibu for a long interview for the French Website EndlessLines.Free.Fr. If you want to read the French interview, it is located here. C'est quant même dingue !!! Il faut que ce soit un Français qui fasse cela aux States... On est même pas foutu de faire la même chose en territoire de Gaule, à part écouter des bardes Gaulois chanter pour les Resto tu meurs.